"Future Children," a short film by Emily Eaglin ('13) won her the Best Director and Best Actress award at the CMF Campus MovieFest, the world's largest student film festival. According to Eaglin, the video is a comedy/documentary about race relations especially pertaining to racial micro-aggressions of those who are more than one race. Eaglin currently attends the University of Maryland, Baltimore County (UMBC). Eaglin's video also features Blake Alumni such as Paul Choi ('13) and Amy Hoang ('12). Chad Sanders, a 2006 Blake alum, fits right into the innovative world of the present as he uses his talents and skills to pursue his interests. After graduating high school, Sanders attended Morehouse College in Atlanta, Georgia where he wanted to create a plan for the rest of his life. “Like so many high school graduating seniors, I was unsure of exactly what I wanted to do ‘when I grew up’.” However, Sanders was well equipped with backgrounds of music, athletics, media, and writing going into college. At Blake, Sanders played boys’ basketball for all four of his years and was an avid sports fanatic. He learned a lot about basketball and about life from Mr. Pigrom, the former coach, who is described as “an excellent role model, teacher, and mentor.” His versatility does not end there, as he played trumpet for the school band and independently played piano for the majority of his life. Blake was a significant factor in shaping Sanders’ identity and provided him many opportunities to grow as a person. Now, Sanders is tackling something he has never done before—writing a movie script. During his time in high school, Sanders was a part of the journalism program under the instruction of the legendary Mr. Keegan. Sanders put his writing passion into practice as a sports editor for the Blake Beat. While at Morehouse, Sanders had a random conversation with a friend that eventually led to the production of his own film, Heaven Hath No Fury. Sanders and his business partner, Leon Chills, are working on the film with their recently created production company, “it.Pictures,” a company focused on filmmakers of color and independent and upcoming artists. They are working with Dexter Davis to make this dream a reality. Sanders has continued to succeed through high school, college, and in the professional world. He remembers his time at Blake and still thinks about the things he learned, both in and out of the classroom. The Blake community helped him create an identity for himself and gave him many opportunities to succeed. Sanders also accredits his success to the Peoples Community Baptist Church, which is only a short drive away from Blake. He says that his spirituality and the relationships and friendships he created there helped him create even more connections that led to success. Whether it is working in a new department of Google, negotiating with new business leaders, or progressing with his latest film, we can always expect great things from Chad Sanders. As he says, and as we can all agree, “I love BHS.” Once a Bengal, always a Bengal! Myoung Shim, alumna of the class of 2010, uses her creativity to make different advertisements and posters. Shim studied at Montgomery College and received her Associates in Illustration. She is currently enrolled at the University of Maryland, College Park, but is also taking classes at Montgomery College. She was given the opportunity to design posters for the Theatre department, for three different shows! The Theatre department paid her for these posters, and Shim is continuing to pursue her artistic career. Kelly Emery, alumna of class of 2003, is now a third grade teacher at Wood Acres Elementary School in Bethesda, MD. After Blake she went to Frostburg State University and received a Bachelors in Elementary Education. As of 2014, she recently graduated with her masters in Elementary Education from Towson University. Chris Romer, also a 2003 alumnus, received his bachelors in psychology from Frostburg State and his masters in school counseling from Johns Hopkins University. He is now a school counselor at Forest Oak Middle School in Gaithersburg, MD. One day, Chris came to Kelly's third grade class to read a story to them. He later had a coworker of Kelly's to distract her in another room. While she was gone, he organized the students to hold up signs that spelled out "Will you marry me, Kelly?" When she walked in, she was filled with shock and excitement and a lot of tears and smiles came from herself, Chris and students. The students had a great story to take home to their parents. Chris and Kelly plan to have their wedding in June 2015. Silver Spring, MD (10/10/08)-- Three years after her graduation and following her coronation as Miss Maryland in June, Class of 2005 alumna Louise Schlegel will compete in the Miss America Pageant January 24. Schlegel, who is taking a semester off from her senior year at University of Maryland Baltimore County, has only competed for two years, making her relatively new to the world of pageantry. “It was something completely outside of my life and my experiences,” she says. Today Schlegel returns from four weeks of filming in Los Angeles for TLC’s reality show, Miss America Reality Check, which airs in early January. All 52 contestants of the Miss America Pageant will be living together during filming. “I’m actually more nervous for this reality show than for the pageant,” Schlegel adds. Both the state and national competitions are more than just beauty pageants, despite popular misconceptions. The Miss America Organization sponsors the Children’s Miracle Network and Big Brothers, Big Sisters. “It’s an organization that really cultivates young leaders,” Schlegel says. She additionally supports the Dave Thomas Foundation for Adoption, which helps children get out of foster care and into permanent homes. 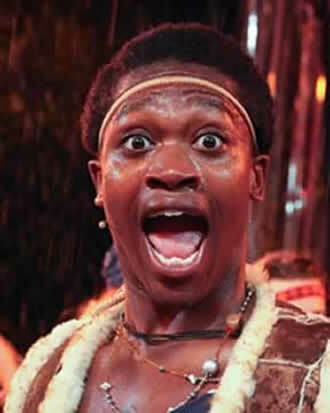 Blankson-Wood is making his Broadway debut in the musical Hair. The musical focuses on 1960s issues, including race, drug use, environmentalism and the Vietnam War. Playing the role of a hippie tribe member is no challenge for Blankson-Wood though. “I feel as though my character is…close to the person I would have been in 1968,” he says. After joining the cast of Hair, Blankson-Wood quickly realized that one of the key elements in making a musical successful is the close relationships among the actors on stage. “The show hinges on the group interaction, so it’s really important that we connect every night,” says Blankson-Wood. After graduating in 2002, Blankson-Wood originally had no intentions of pursuing a career in professional acting. However, he spent three years at New York University’s Tisch School of the Arts, a school well known for producing world renowned actors, studying Musical and Experimental Theater. Silver Spring, MD (11/14/08)-- Phil Kauffman, father of Blake alumnae Rachel and Jordi Kauffman, was elected to the Board of Education November 4 after winning 67 percent of the vote against opponent, Tommy Le. The first tasks the Board will face after he is sworn in December 4 will include settling the school system’s budget and appointing a new superintendent. At the top of his personal agenda, however, is improving pre-established middle school reforms. “I think [it] is an important initiative that we need to continue and figure out how exactly we can reach kids who are starting to fall behind at middle school level,” he says. Silver Spring, MD (11/14/08)-- If your grandma passes her time knitting scarves, tell her to drop those knitting needles, whip out an elastic band and pop in a “Your Body is Meant to Move” DVD so she can continue to stay healthy and send you that birthday money year after year. The production team shot the “Your Body is Meant to Move” DVD in two-and-a-half hours, while instructor Dave Reynolds and two other senior citizens performed the exercises. “It was just amazing to watch people at their age move like they do,” says McDaniel. The 45 minute DVD can be bought by contacting drafitness@comcast.net. It has been selling for $24.99 at and it even comes with a free exercise resistance band. “The image I most vividly remember is the elastic band exercise…[it] was riveting,” says Howe. To thank the students for producing the DVD, Eubie TV received money for new equipment. “We feel that the students both behind the cameras and others involved in this project at Blake conducted themselves in a professional manner,” says Ms. Kardeman.